Healthy Salads - or Not? When we think in terms of salads we always think in terms of a healthy meal. There's lettuce which is a veggie and very low in calories. Plus the other vegetables like tomatoes, carrots, peppers, etc. These are all healthy foods so the salad must be healthy as well – right? Although the aforementioned foods are healthy, we very rarely stop just there when putting together our salad. Just a plain veggie salad does not have much flavor. If we stopped there it wouldn't really be the meal or side dish we are looking for. So we add the “goodies” and bring on the “fixins”. This is where “healthy” starts to take an unhealthy turn. Let's take a look at salad bars as an example. Of course there is the lettuce and other vegetables which are healthy. But then there are those tempting items like bacon bits, croutons, fatty cheeses and meats, and the nuts. Even some of these items do provide some protein and other nutrients, they also tend to be higher in calories and fat. These toppings however are not the one item that can really add up the calories. The one single item that can take a healthy salad and put it over the top (on calories, fat and even carbs) is the salad dressing. Depending on the amount of dressing you use it can account for more than half the calories of your total salad. Before you drench your salad in the extra fatty dressing, think of other ways to add healthy flavor. For instance, add some fruits. Fruits provide lots of nutrients and can satisfy your sweet tooth. Try some raisins, strawberries, pineapples and even bananas. This will liven up your salad with some sweet and nutritious flavor. Try replacing your salad dressing with a squirt of lime or lemon juice. This will give your salad a light and zesty taste without puckering your lips. With the health conscious society more and more places provide fat free or low fat alternatives. This applies to your favorite salad dressings to the cheese you put on top. So go ahead and sprinkle a little cheese for flavor, just opt for fat free or low fat versions. Select a fat free salad dressing as well. Of course the flavor is slightly different but it will still add some zest to your salad. Try something new for your salad. There are many different toppings you can add that will make a healthy salad. Try adding something new like kidney beans, chickpeas, black beans and lentils. These add lots of protein and are a great alternative to the high fat meats like pepperoni and salami. 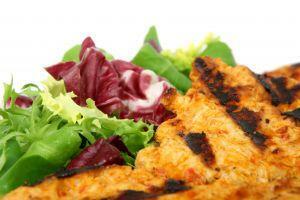 If you want some meat on your healthy salad add turkey or chicken instead of the higher fat meats. If you just can't get used to the taste of the low fat or fat free dressings, then go ahead and grab a spoonful of the regular stuff. Just put it on the side and then add just a tad with each bite of salad. Simply dip your fork into the dressing to grab some up and then take a bite of your healthy salad. This will keep you from adding too much dressing. Put other temptations on the sideline as well. If you want some your usual favorites like bacon bits or sesame seeds, put it on the side. Try eating half your salad without adding these and then add just a little at the end to satisfy your taste buds. Another way to really liven up your salad is to go crazy with the vegetables. As a starter, use some mixed greens instead of just ice berg lettuce. Add some baby spinach, red cabbage, romaine lettuce and broccoli florets to add flavor and color to your salad. Continue adding other veggies like carrots, cucumbers, celery and even some beets. Adding a variety of vegetables you are not only adding lots of color but you are getting tons of vitamins and minerals. Not to mention that you will have a large salad (helping fill you up) with fewer calories. Remember, if you want a healthy salad you must pay attention to the ingredients you place in it. With a watchful eye and a little self control you can have a healthy salad that tastes great too. For some healthy salads idea, try this tuna fish salad with lemon French dressing. After all, not all salads have to have lettuce. Use these tips to help you eat healthier. Eating right can help you lose weight and ward off many medical conditions. Add some of these foods to your next meal or recipe. They have natural components that help boost your metabolism to burn more calories. Make sure you get enough fruits and veggies in your meals. Read this article to learn how much of each you should have in a day.